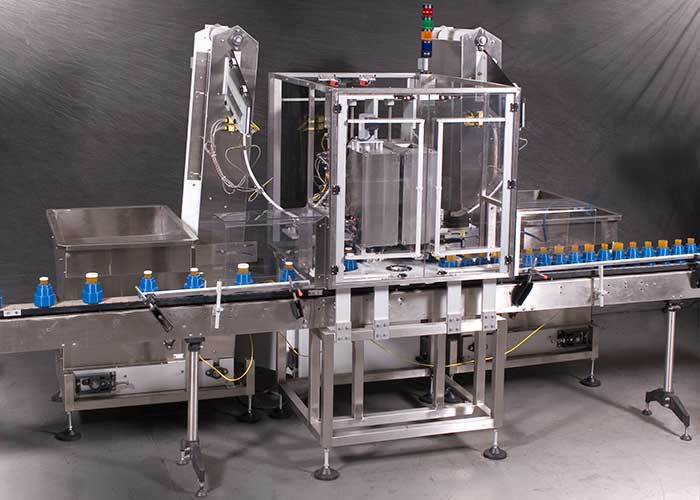 New England Machinery’s Dual Head Capping System is a complete capping system that includes: cap bulk supply, cap orienting and delivery, cap placement and tightening, container infeed, staging and discharge onto the customer’s existing conveyor. Featured in the New England Machinery, Inc. NEDHC design are two independent capping stations, multi-indexing star wheel, and two bulk cap supply sorting systems. The combination of the multi-purpose indexing star wheel and heads provides a robust machine platform in a compact footprint. Provides positive capping of two containers per machine cycle – increasing throughput rates and overall line efficiencies in a compact footprint. Non-scuffing, no tool and quick change collets allow for gentle positive grip.